When our daughter was born, there was no manual on how to operate her, and there were no warning lights or alarms to let us know something was wrong with her. She pretty much had one alarm to let us know something was wrong, crying. Crying is a great warning system, except it, was the same alarm for everything! If she was hurt, gassy, diaper full, or not feeling well. It’s the equivalent of the “Check Engine” light on your car. When it comes on, it can be something as simple as a loose gas cap, or something more sinister such as a failing catalytic converter, oxygen sensor, or even a failing central computer system. To prevent hours of time wasted chasing the error and thousands of dollars, mechanics, and savvy home mechanics use a “diagnostic reader” to help them decipher the “check engine” alarm. While there are no diagnostic reader systems that will decipher exactly why the baby is crying, there are tools parents can use to quickly focus in on the problem. A great baby thermometer is one of these tools. It helps you find normal child temperature as a fever is one of the most dangerous things to a youngster. And there’s nothing scarier than a baby fever. A good thermometer is the best “Early Warning System” that an infant is getting sick. There are many thermometers on the market, but what really is a “good” or better yet a “great” one? 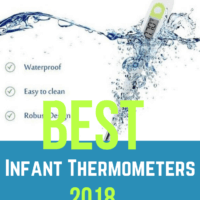 Well, we hope to answer this question and find the best infant thermometer for the best price for you. 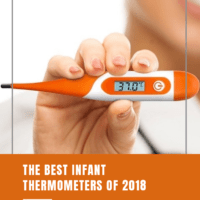 Which Kind of Infant Thermometer is Best? A mechanic is only as good as the tools that he owns. The same goes for the type of thermometer you use at home. As parents, we don’t have many tools to help us diagnose our little ones ailments. And running to the Emergency Room can get pricey very quickly. A thermometer for baby is one of those items in your mommy toolkit that will probably last you for many years. So invest wisely. While there are some great ones to find around the $10 range, we’ve found that the best infant thermometers are in the $30 range. The biggest no-no are mercury thermometers. Yes, they worked great when many of us were kids ourselves. But that was also the era when wearing seat belts (actually lap belts) was optional. It’s the 2010’s, it’s time to ditch the extremely toxic heavy metals and move on to the latest new technology that is safe and toxic-free for our infants. There are also non-contact thermometer available. But there is some controversary as to their accuracy, so we have left them out of our thermometer review for now. 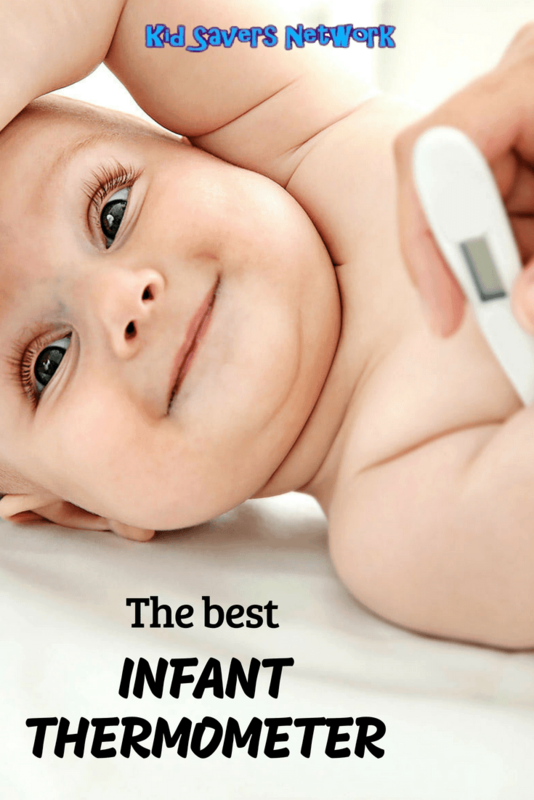 The #1 thing when it comes to babies, is finding an accurate thermometer. The kind of thermometer that is best for you and your infant depends on their age and personality. If your baby is closer to a newborn; a rectal thermometer could be best. If your little one is especially fidgety; a temporal artery thermometer might be better. If you’re not sure, there’s some great “Dual” thermometers on our list below in our thermometer review. Fret not, we will help you find a thermometer for baby that is right for your family. As you would expect, infant thermometers use some of the latest technology to improve comfort and accuracy to diagnose a fever. 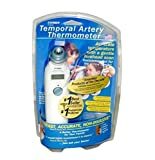 The latest Temporal Artery Thermometers were released back in 2014. They and the infra-red ear thermometers allow an infant’s temperature to be taken without physically touching your baby. We can now take their temperature while their sleeping. The younger the infant, the easier it is to take their temperature measurement using a rectal thermometer. This goes, uh, you know, in the little one’s bottom. The rectal thermometer is still the “Gold Standard” for newborns. They are the most accurate but can be uncomfortable for infants. Probably the least favorite for parents taking a baby’s temperature, too. As they get older, this gets to be quite a bit more problematic to take the temperature this way. TIP: Many of the newer thermometers are dual-purpose oral & rectal thermometers. Once you use a thermometer rectally, take a sharpie and mark it as such on the thermometer. While you could clean the thermometer thoroughly and use it later as an oral thermometer, we don’t recommend it. Why take the risk? Many doctors have moved on to the baby ear thermometer. It’s the second most accurate method, is quick, with little fuss. Digital Ear thermometers use an infra-red beam to check the child temperature inside the ear canal. They work just fine with adults but are not recommended for infants younger than 6 months. Or older if your baby is a bit fidgety like mine…! They’re one of the best baby ear thermometers to detect a fever. There are infants that complain when the tip of the thermometer is shoved into their ear, so it’s not for every child. Con: The ear canal needs to be big enough to get a temperature measurement, which makes it mainly for older babies. Benefit: Accurate and quick. One of the easiest methods to get a temperature measurement. The forehead is an easy place to take a temperature measurement. These are commonly referred to as forehead thermometers, but you often see them labeled in stores as temporal artery thermometers. 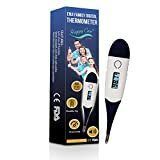 Temporal artery thermometer is a type of thermometer that uses infra-red technology to scan an infant’s forehead and get a fast, precise temperature reading. You don’t even need to actually touch your infant’s head. Just swipe from a few inches away for a temperature reading. 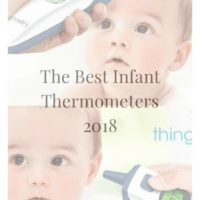 You can find more information and reviews at our page “Finding the Best Forehead Thermometer for Babies“. These aren’t as accurate as rectal or ear thermometers, but the convenience makes them so appealing. Con: Accuracy depends on buying a really good thermometer. As well as practice in taking the temperature. Most people take 3-4 temperature measurements to make sure they get a reliable reading. Benefit: Very quick to get a temperature measurement and identify a fever. The armpit is one of the easiest places to take a temperature. But the armpit thermometer is also one of the least accurate methods to take a temperature measurement. Benefit: Super easy to take a temperature measurement. Taking a temperature measurement orally is one of the oldest and proven methods. It’s still used in many doctors offices. But it is also one of the most problematic methods as it takes time to take the temperature, anywhere from 10-60 seconds. And that length of time to keep a probe under the tongue can feel like an eternity to a sick infant. There is also a more modern version of the traditional oral thermometer called a digital pacifier thermometer. Parents see this as a solution to the lenght of time and placement of the temperature probe in a childs mouth. Using a pacifier thermometer is a very soothing way of taking an infants temperature. However, they are not recommended for newborns. An infant must be able to keep a pacifier in their mouths for 3 – 5 minutes to use one. Con: They take a while to get a reading and placement in the mouth can vary accuracy. You also need to make sure it stays sanitary and clean after every temperature measurement. As time has moved on, technology has allowed multi-use thermometers to come on to the market. Some of the trends that we are seeing are below. 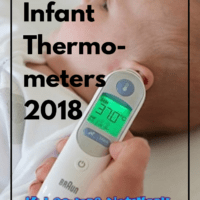 Multi-Use Thermometers usually have a small metal tip which can be used to take an infants temperature orally, under the armpit (auxiliary) or rectally. Good for those who like to double or even triple check (and who doesn’t with kids!). 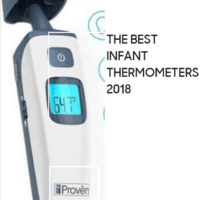 The latest innovation include the dual forehead and ear thermometers such as the iProven look set to be a winning combination for the future. iProven has a winner on their hands here. The DMT-489 is one of the most popular thermometers on the market to accurately get an infant temperature. Mainly to the praise of its customers that it’s easy to use. It utilizes infrared technology to improve accuracy. Fevers are easy to identify with this thermometer. 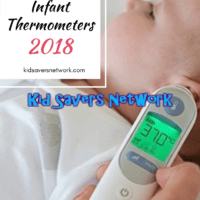 This is our favorite thermometer review for 2018! Double-Check Measurements: Being a dual-function thermometer has it’s benefits. With one device, you can take an Ear temperature measurement and a forehead measurement. Two different temperature spots help validate the accuracy against each other. Easy To Use: It has a large display and 2 big buttons. One button is labeled “Forehead” and the other “Ear”. Accurate: Real-world unscientific feedback has been that this is just 0.2 degree’s off (at most) from hospital grade oral thermometers. Fast: This is an instant-read thermometer. Basically getting a reading at the click of the button. Forehead measurements only take 3 seconds. Batteries: It uses standard AAA batteries. Not some special hard-to-find proprietary battery, rechargeable battery that requires an AC Adapter, or a special watch sized battery that are always a pain to find in the store. Display: It is illuminated, so you can use it during the day AND during the night, without having to turn on a light and waking up the sick child. Ear Covers: the unit doesn’t come with disposable ear covers. Some find it OK using it without ear covers for different kids, some prefer to purchase the ear covers separately. Others have found buying some disposable alcohol wipes (much cheaper option) and cleaning the tip of the ear thermometer good enough. No Backlight: The display doesn’t come with a backlight. So it’s hard to read in a dark room. The Braun ThermoScan5 is an Ear Thermometer. It doesn’t have dual or triple functions but it does one thing extremely well, take temperature measurements from the ear. Braun is a popular household name associated with quality products. And the Braun ThermoScan ear thermometer is another quality item. As with other quality thermometer’s, the Braun ThermoScan5 uses infrared technology to get accurate results. It measures the infrared heat generated by the eardrum and surrounding tissue, to deliver a very accurate temperature measurement. The Braun ThermoScan ear thermometer has also been noted as a popular model used by many doctor’s offices. Easy To Use: The Braun has a guidance system to help you get to the proper position in the ear canal to take the best temperature measurement. This unique positioning system uses a beep and light to confirm proper positioning. Accurate: The Braun ThermoScan employs a patented pre-warmed tip. The skin inside the ear canal is very sensitive, and the cold tip of other ear thermometers can cause fluctuations in readings. With the pre-warmed tip, the ThermoScan provides one of the most accurate measurements around. Comfort: A flexible tip is used to provide comfort to a wide range of patients. Lens Filters: It comes with 21 lens filters in the box. More can be purchased here. No Display Backlight: It does not have a backlight for the display. As a result, it is difficult to read in a dark room. The Exergen temporal artery thermometer model Tat-2000c is a fantastic thermometer. Temporal thermometers are pretty accurate, mainly due to the fact that it measures the carotid artery, which is connected directly to the heart. It provides constant blood flow to allow one to take an accurate measurement and allows quick detection of a fever. Easy to Use: To guide you in use, it employs a red light and a gentle beep to provide the feedback on the scan. Batteries: Uses a common single 9v battery. Making it very convenient to replace batteries when needed. 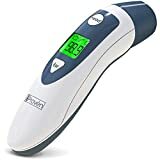 Popular: The Exergen temporal artery thermometer model Tat-2000c is a very popular thermometer and is one of the top-rated forehead thermometers. Takes Practice: As with any forehead scanner, it usually takes some practice in getting a smooth pass of the forehead to get an accurate result. Many readers say they do 3 scans to feel confident in the reading from their Exergen temporal artery thermometer. The Clinical Digital Thermometer by Generation Guard is one of the cheapest and most popular thermometers. It’s a traditional oral thermometer often used to replace mercury oral thermometers. It uses microchip technology to take an oral reading in 15 seconds, 4 times faster than conventional oral thermometers. It is primarily used orally, but it can be used rectally as well as underarm to identify a fever. 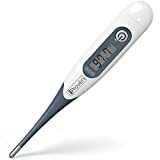 Price: One of the most inexpensive thermometers on the market with great reviews. Comfort: It comes with a soft bendable tip, which is welcomed relief when trying to take an oral temperature. Batteries: It uses a LR41 watch type battery instead of a common household battery like a AA, AAA or 9v. No Backlight: It doesn’t have a backlight, so it is difficult to read in dim or dark baby rooms. The Enji TH-65 is another digital oral and rectal thermometer. It boasts of a super fast 10 second reading time and gets close to an instant-read thermometer. Parents are also much more successful with the quick time which makes it easier to get a rectal temperature. It is a type of thermometer that is waterproof, mercury free, uses a flexible tip, and has its own plastic case. 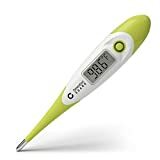 It is another very popular thermometer used to detect a fever. It doesn’t come with probe covers, but you can use these to make for a no-clean use cycle. Comfort: It also utilizes a flexible tip, making it much more comfortable when taking an oral reading to determine baby body temperature. The iProven DT-R1221 is a digital oral and rectal thermometer. It’s slogan is, “Frantically Fast, Flawlessly Flexible, Familiarly Functional”. Very quick in identifying a fever or determing an infant temperature. It is a mid-priced thermometer, but does come with a fantastic 100-100 warranty. Which allows for a hassle-free refund within 100 days. Speed: It is extremely fast, taking a temperature measurement as fast as 10 seconds. Which makes it much more successful when getting a rectal temperature. Do you use any of the thermometers on our list? Or do you have a different choice for the best infant thermometer? Be sure to tell us in the comments section.